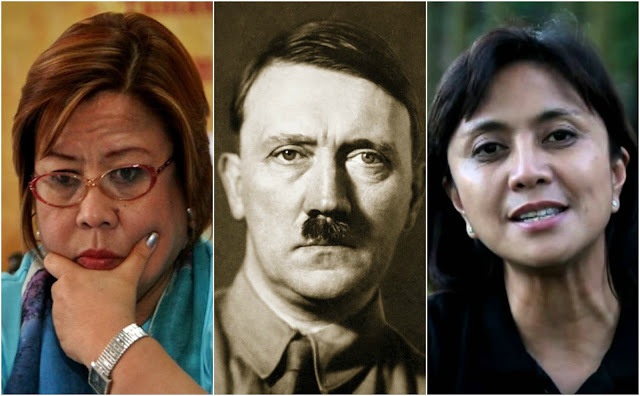 Thinking Pinoy: Duterte and 3000 Deaths: Did Hitler inspire the Liberal Party? Duterte and 3000 Deaths: Did Hitler inspire the Liberal Party? Yes, that's Adolf Hitler in the middle. You'll learn why. Note: mamaya ko na to ipu-proofread. Antok na ako e.
The plausibility of a scientific theory relies on how good it fits data. That’s how science works. When a theory starts to fail at explaining new data, it’s time to reject it. For example, Newton’s Laws were the best there is for over 200 years. They’re simple, straightforward, and they don’t require advanced math. However, the discovery of exotic behavior of subatomic particles and the constancy of the speed of light, physicists discovered that Newton’s Laws don’t hold at very small scales or very high speeds. As a result, Max Planck’s Quantum Theory and Albert Einstein’s Theory of General Relativity were born to takeover Newton’s Laws at very small scales and at very high speeds, respectively [History, History]. Human rights groups have been accusing Duterte of sanctioning extrajudicial killings since god-knows-when, but they have ramped up their rhetoric since Duterte’s June 30th oath of office. I am against extrajudicial killings myself, and the fact remains that at this point in the article, the Duterte-killed-them-all Theory still holds. So why don't we put it under the microscope? Now, it’s time to break down this theory and see how well it explains known data. Going by Hontiveros’ logic, does it mean that Duterte is actually against extrajudicial killings? He has repeated these instructions numerous times, including last week during one of his speeches. But then, these instructions fits perfectly to established jurisprudence enabling legal warrantless arrests [TP: Warrantless]. Besides, let’s take a look at former President Aquino whom Sen. Hontiveros is arguably a fan of. A Taclobanon who almost died from a shooting incident amidst the post-Yolanda looting and violence told Aquino his story. Senator Hontiveros, are you also implying that Aquino’s indifferent words have the force and effect of law too? That Aquino's apathy for the plight of the common man was actually part of state policy? Does Roxas' statement that Aquino was best president ever imply that Roxas also believes in an apathetic government? Sen. Hontiveros' axiom contradicts itself. That is, the president’s words having the force and effect of law is wishful thinking on Sen. Hontiveros’part. Now, let’s take a closer look at Duterte’s diabolic threats to criminals, such as when he said he’ll dump the bodies of criminals into Manila Bay, or the downright scary, “I will kill you.” Is this legal, or is Duterte breaking the law by uttering these lines? As a regular citizen, if this is the price to pay for an unprecedented mass surrender of criminals [ATimes], I do not really mind. We’ve used pretty words since 2010, and look where it got us. Do words kill? No. They scare, but they do not kill. I couldn’t care less. I do not know if the reader needs further spoon-feeding but I think it’s quite clear that he says his threats end in threats. Unless somebody can provide me evidence that he indeed ordered the killing of a suspected criminal, this issue about his “exceptionally harsh words” do not really mean anything to me. Now, has the opposition cited even one instance where Duterte ordered a successful extra-legal killing? Dear Opposition, toughen up a bit. Life is not rainbows and butterflies. Spare me from the bullsh*t.
If we’re just going to look at the absolute figures then yes, the numbers are staggering. The problem, however, is that this observation means little if we will not take into consideration the magnitude of the problem. Using general anesthesia before a tooth extraction is just stupid. But if you’re getting a multi-organ transplant, using local anesthesia would be stupider. PDEA estimated in June 2016 that there are at least three million drug addicts in the Philippines [Inq]. Of this figure, a total of 709,527 surrendered as of 11 September 2016, where 52,568 are drug pushers and 656,959 are drug users. Most of these people surrendered voluntarily, while 16,025 were arrested during anti-drug operations. These anti-drug operations resulted in 1,466 deaths, or roughly half of about 3,000 who died since 30 June 2016 [TV5]. The figures above show that law enforcement operations resulted in 16,025 arrests and 1,466 deaths, translating to roughly 1 death per 11 successful arrests. For a regular citizen like me who’s not used to seeing violence first-hand, and given our perennially under-equipped and under-funded police force, that death-to-arrest rate doesn’t look that bad.If the Philippine drug problem was a surgery, it would be a multi-organ transplant that requires a powerful anesthetic, and figures suggest that we have a pretty good anesthesiologist on duty. Given the magnitude of the drug problem, I even find it interesting that only 3,000 were killed, which pales in comparison to Mexico’s war on drugs [PBS]. Imagine you’re getting a facial treatment and the last facial you had was a decade ago, would you complain if the facialist gets a bucketful of whiteheads and blackheads? If you answered yes, then please come over here and I will smack some sense into you. Super-duper is not really part of my vocabulary, but I was inspired to use it after learning that the Supreme Court’s Public Information Office seemingly watched too many reruns of Lindsay Lohan’s “Mean Girls”. If Duterte indeed sanctions extrajudicial killings, why would the police bother to arrests that many? Why won’t the police just shoot them all? It doesn’t add up. I think it goes without saying the Liberal Party has more than enough financial, logistic, and political muscle, to do its bidding, even up to this day. With such as “staggering number of casualties”, I cannot help but wonder why it has so far failed to get enough evidence to prove that Duterte indeed perpetrated these assassinations. Has the Liberal Party lost its steam? I do not think so, because a large number of Liberal Party members are implicated in the drug trade. Just look at LP attack dog PNP General Garbo and and LP attack b*tch Senator Leila de Lima. It is in LP’s interest to find enough evidence to bring Duterte down. Besides, Vice-president Leni Robredo is from the Liberal Party too. Why hasn’t LP gone the extra mile to find enough evidence that would catapult them back to Malacañang? So far, there can only be one explanation: they can’t find any. The Liberal Party-controlled Commission on Human Rights has hounded Duterte with allegations since 2009, it has been aggressively looking for evidence since then. So far, not a single case was filed against Duterte, for the sheer reason that there's no evidence linking him to these extrajudicial, extralegal killings [TP: PLeni]. The Liberal Party, and the Liberal Party-controlled mainstream media, loves mentioning the "Rule of Law". But isn't it true that the rule of law dictates that one is innocent until proven guilty? LP can't even find a single piece of evidence pinning Duterte, yet here they are telling the entire world that Duterte is a megalomaniac butcher. What's worse, they have been using that same fallacious allegation over, and over, and over. Basically, despite their inability to find even probable cause, let alone a court conviction, LP is trying to convince the world that Duterte is a mass murderer simply by repeating the same allegation across every conceivable mass communication platform on the planet.